Granddaughter and almost namesake, Lainey, turned 13 on Tuesday last, and the past weekend we had a celebration for her here at the farm. Just the cousins, as she is hosting a friend party on this Saturday. It was a lovely day and it drew the kids outside to feel the first kisses of spring. 3 are teens already and Jade will be 12 in July. Rather amusing to see them still swinging on the wooden swing set Joe built years ago. 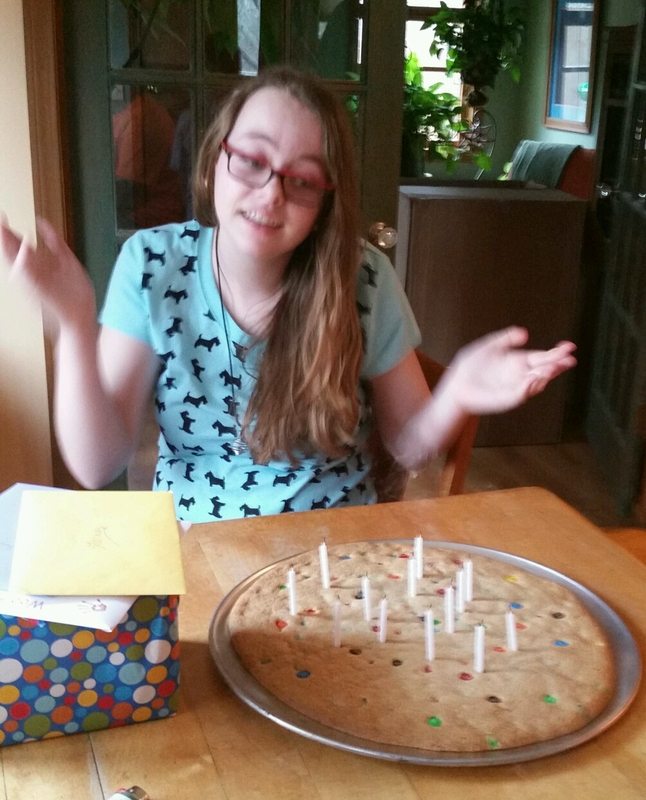 Lainey traditionally asks for a giant M&M cookie and Anah ( bless her little pea pickin' heart) volunteered to bake it. She did a great job. The 3 girls spent the night. They scripted and performed a bit of live theater for us. The program was complete with commercials which, truly, amused me the most. Quite a while since they have done a triple sleepover as all are so busy now. Lainey is involved in band and has been dancing for 11 years, Anah is a soccer player and recently became quite passionate about theater, and Jade plays basketball and softball as well as being involved with church and definitely the most social of the trio. We adults were pleased to see them playing much as they used to as smaller children and bit melancholy knowing that soon they'll be off to college. Whoosh there goes time again, moving so fast. Today, I'm putting the house back together and enjoying some quiet time.